Impact, water, humidity and corrosion resistant. Does not support bacteria. Extemely durable due to dense components combined with stainless steel brackets and fasteners. Surface sheets fused at high temperature and pressure. Decoratively faced on both sides as part of a resin-imprinted kraft paper core. Recommended for high traffic useage where durability and strength needed. Partitions form a between 2 walls stall. Includes pilasters, door and a panel to form the front. Partitions form a corner stall(s). 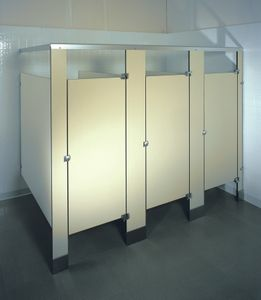 Includes 2 pilasters, a door that form the front and a panel in between stalls and at the end.